Let's say you want to calculate a VaR for a portfolio of 1000 stocks. You're really only interested in the left tail, so do you use the whole set of returns to estimate mean, variance, skew, and shape (let's also assume a skewed generalized error distribution - SGED)? Or would you just use the left tail (let's say the bottom 10% of returns)? For some reason, using the whole set of returns seems more correct to me (by using only the left 10% or returns you'd really be approaching a non-parametric VaR). But using the whole set of returns would likely cause some distortion in the left tail in order to get a better fit elsewhere. How are the pros doing this? Thanks! Contrary to this notion is the fact that the PBH theorem states a result based on the assumption of threshold values approaching the right endpoint of the distribution F. This implies that better GPD fits are expected for larger choices of the threshold u. One must strike a balance between choosing u large enough so that the theorem is applicable from a practical standpoint and small enough so that a sufficient number of data points can be used in estimation of the parameters of the GPD. One approach is Conditional Value at Risk (CVaR) a.k.a. Expected Shortfall (ES). It does, as you suggest, take into account the whole set of returns. However, instead of traditional VaR which asks "what is the worst 1% or 5% loss I can expect" in a given time frame, conditional VaR asks "assuming I sustain losses of at least 95% or 99% (and perhaps am capitalized to sustain losses of only this amount), what is my expected loss (or shortfall)" for this time period? It can be argued this is more relevant for understanding the impact of more dire scenarios. Another approach from Extreme Value Theory is concerned with strictly modeling the heavy tail of the returns. Generalized distributions (e.g. Gumbel, Frechet) can be fit to the tail(s) in question via something called the Hill Estimation technique. These are covered in depth in literature should you be interested in more detail. I can't comment yet on the topic due to my reputation level (so I will throw an answer up) but having just done my MFE capstone research on EVT implementation for VaR. According to my advisor who was a director of a quant research group at Citi before returning to academia, not many people are doing this. My research was to start collecting data comparing EVT to various numerical methods for VaR/CVaR. When one does a Monte Carlo or something to generate returns or looks at an empirical distribution they are throwing away all the points not in the tail when a VaR is calculated so why not just start with the tail by using EVT techniques. From my research, it is somewhat arbitrary where to set the threshold. 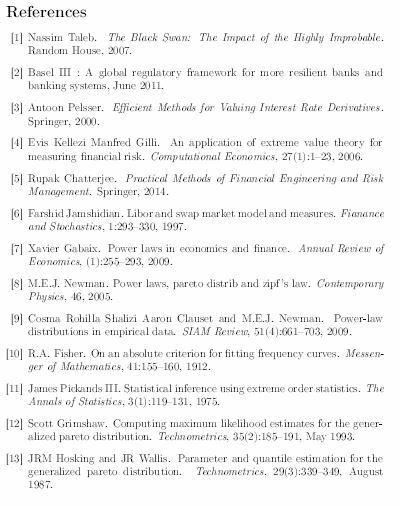 I am posting my research bibliography but one of the papers I cannot remember which) stated that most will shift the threshold arbitrarily into the tail until a GPD is achieved. Below is my bibliography. There are entries that aren't relevant but quite a few that may be of value. Not the answer you're looking for? Browse other questions tagged risk probability estimation var expected-return or ask your own question.